Remember last year July when the first FQ retreat took place in South Kensington. 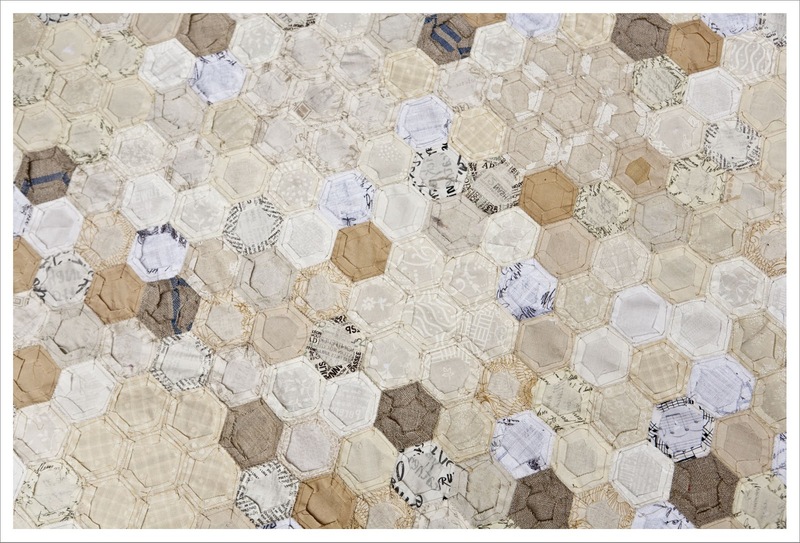 And remember that I started guided by the great Tacha and Brioni my neutral Hexagon quilt ? Well I have worked on and off on the piece over the past 9 months and made a massive push towards the finishing line when I spend a long weekend at my parents a few weeks back. I always take something to stitch with me and it usually is either knitting or hand stitching in the absence of my trusted Janome. I love every single hexi in this baby quilt because it includes so many great fabrics. 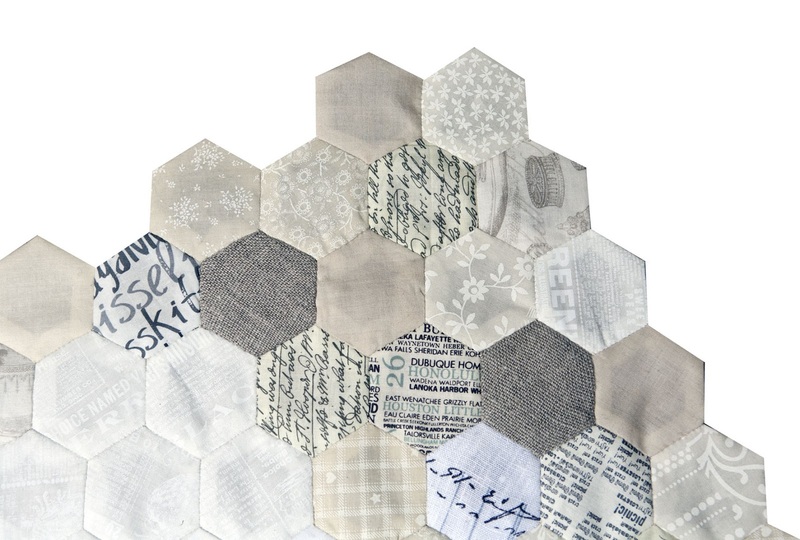 There is tons of Muslin Made from Moda that were left over from one of my first quilts I made. Then there is rough french linen bought at the Cloth House right next to actual old linen from my grandmother. We are talking at least 50 years old. 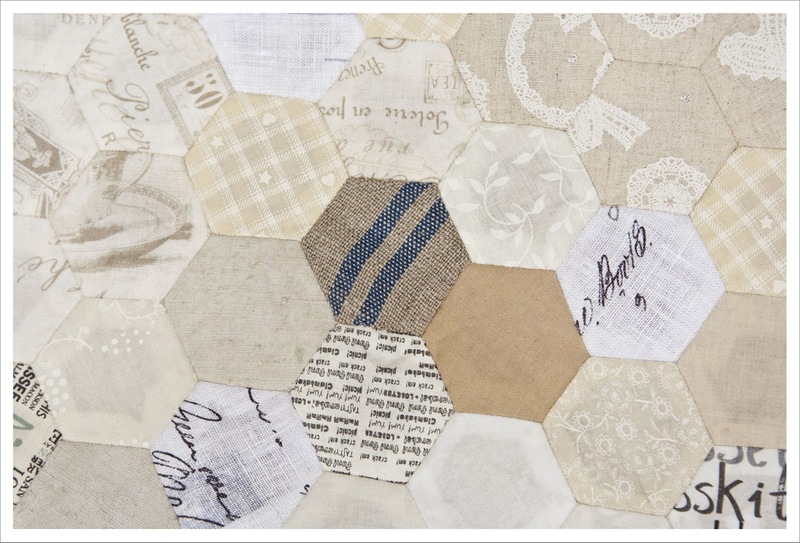 There are modern text fabrics in there, there is Japanese linen in there, there is delicate Oakshott and so much more. And this is the back side just in case anybody wants to know how it looks from the back. Now the big question is how to quilt this beauty ? I have been pondering this question for a while now and can't make a decision. 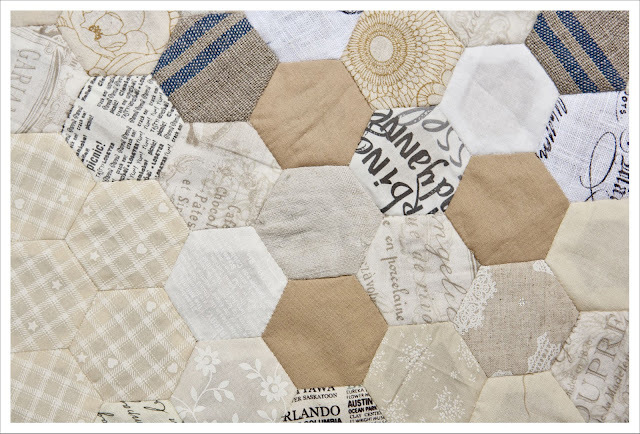 I love the quilt as it is and therefore in-the-ditch quilting would be great but I don't think that is an option as I realized that hand stitching isn't quite as stable and durable as machine stitches so I think it needs to get some extra stability through the quilting process. Should I hand quilt or machine quilt ? Should I sent it to a longarmer for something special ? Should I just stitch along the seems to underline the hexi shapes are totally ignore it ? Tempted to suggest hand quilting in a variety of threads to add a simple texture - neutral colours maybe a meandering line across the quilt echoing the ditch line! I would machine stitch, long length neutral (Aurifil 2021) through the middles, in picture 2 that would be left to right, simple and not to detract from the hexies, but each one will be secure. I would opt for hand-stitching too - it would add lovely texture and my guess is that it would provide the stability you desire, too. it turned out gorgeous! 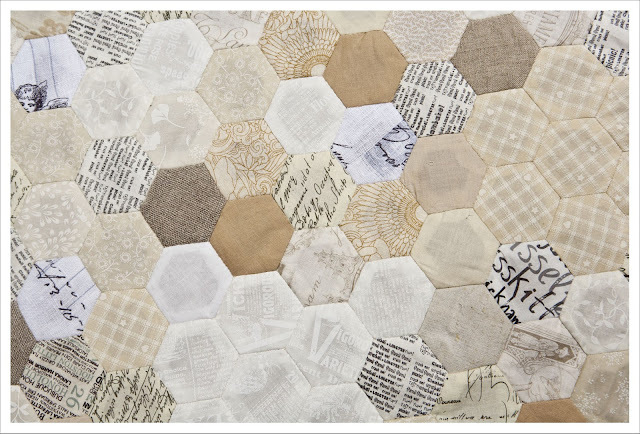 I think I would lean towards hand quilting, but I think no matter what, it will be amazing. Great job. 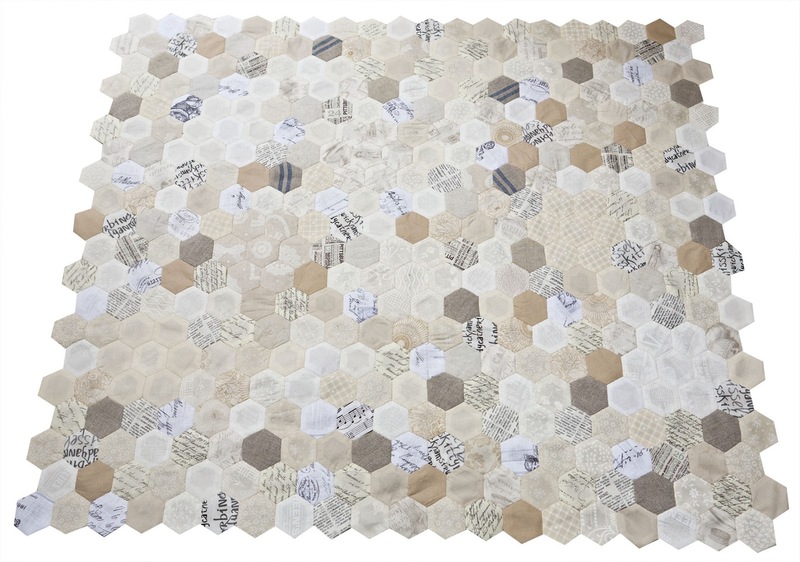 I have no clue how to quilt it, since I haven't made a hexie quilt yet. Good luck. My goodness, it is stunning! 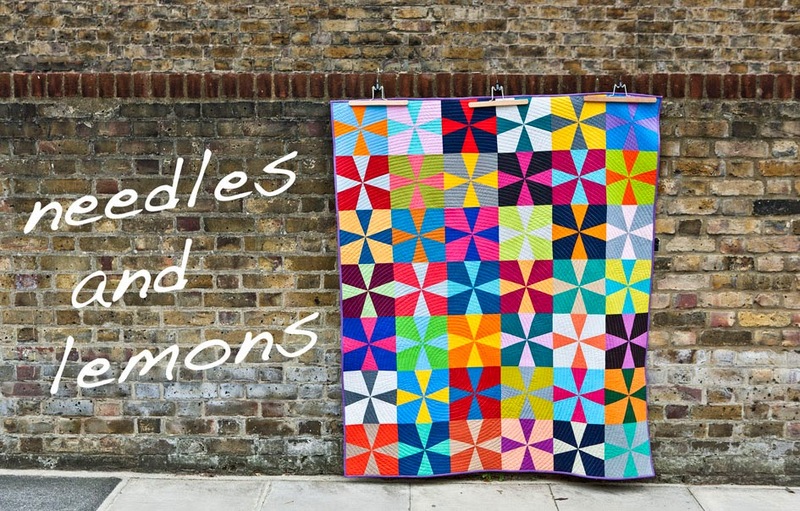 Sorry I don't have any ideas on the best way to quilt it - I wouldn't be able to decide either. Good luck! I have no clue how best to quilt it, but I would probably follow Hadley's advice if it were me. I'm just here to say "Brilliant". I love this puppy.. But I'm kinda sorta absolutely useless at choosing how to best quilt it. Just had to say how much I admire your work. Good luck. I think minimal hand quilting. Definitely not long arm, it will suffocate it. this is incredible. I am going through the same dilemma with my Hexie MF quilt...but I am not finished piecing it yet. But, I think I will hand quilt mine. I dread hand-quilting, because I'm impatient and not great at it, however....I think that with the time and energy you put into this quilt so far, machine quilting would just feel wrong.... though it would stabilize the quilt throughout. I have a finished top of a hexi garden design from great grandma....I am in a similar dilemma, do I finish the way I usually do, with a machine, or put the energy and time that is worthy of this beautiful monstrosity? And I only call it a monstrosity because I dread the adventure because I may not find I am worthy of finishing it. (Still a bit of a novice who wants to finish it for my own kids to enjoy one day.) Well, good luck with all the idea's you have been given! Can't wait to see how you finish it, because I may just follow suit. Take your time, this seems like it will be at least a 3 year project for me!